The tournament in China is almost over. After 7 days of the intense fight, it all came to the 4 teams and 3 matches, two semi-final matches and the grand finals itself. First semi-final match is the one between NRG and Fnatic. Stay tuned and read our full NRG vs Fnatic in-depth betting prediction and find out to what to bet on and why. Out of 6 matches they played on this tournament, NRG won 4 and lost 2 of them. They did manage to stray into the semi-finals somehow and I would say it’s all thanks to the lucky draw and weak opponents. However, they are the worst team in the semi-finals stage and they would surely be stopped. All of their matches finished with the score of 2-0. There was nothing intense, nothing to hope for. This team can’t make a comeback and if they didn’t learn anything new from 5 days ago, they would be stopped by fnatic once again. On the other side, team Fnatic is currently in great form with nothing but victories behind them. They had a clean sweep on this tournament with 3 victories in the group stage and a victory against North in the quarter-finals. I wouldn’t say that luck has to do anything with it. They were just better than their opponents and they earned it. This matchup isn’t so hard to predict. NRG is not good enough to beat Fnatic that is currently unstoppable. These 2 teams played head to head match just 5 days ago and fnatic won it with 2-0. I believe this would be the case again. Fnatic would dictate the pace with map control and that is all they have to do. As we saw it earlier, after gaining the map control against NRG, fnatic is comfortable to do whatever they please. They have the raw power, 5 players with great individual skill and better tactics and map pool in general. Don’t get too greedy on this one, let’s try to keep it simple, no need for handicaps or anything special. 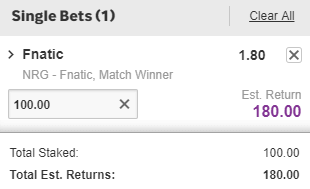 Our tip here is a regular bet on team Fnatic to win outright.